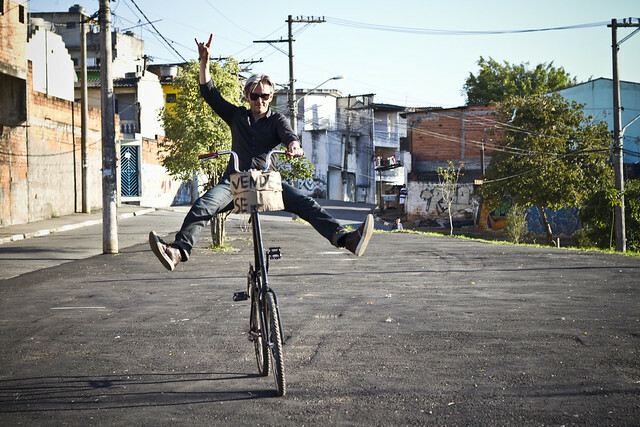 So now I've tried a tall bike. Although not in Copenhagen's North-west neighbourhood or in Portland, as one would assume. 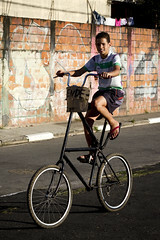 But in a distant suburb of Sao Paulo, Brazil and quite by coincedence, while working on our Escolas de Bicicletas / Bicycle Schools Programme. 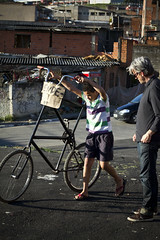 To read how we are putting bicycle course into schools in Brazil, there's an article about it on Copenhagenize.com. 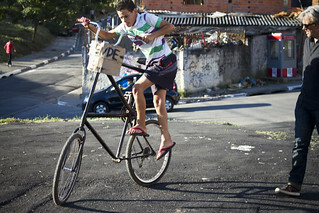 While visiting one particular school in Sao Paulo, the team went for a ride in the community, to check out the safe route the kids will be riding to school on. Then this wonderful kid came rolling up on the bike with a For Sale sign on the front. I asked him if I could give it a try. 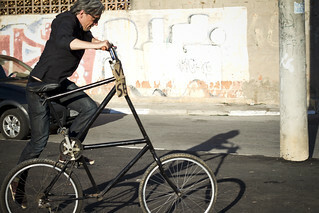 He showed me how to hop up onto it and I was off. Bicycles bringing people together. Nice.